Kea is a large rural parish of small villages and hamlets just to the south of the cathedral city of Truro. It is bounded to the east by the Truro and Fal rivers, and to the north by Calenick Creek. There are many beautiful walks through surrounding countryside and along the edge of the nearby creeks to the historic Roundwood Quay, Cowlands Creek, and beyond to the National Trust Trelissick Estate. Aside from the unspoilt and sparsely populated countryside (with much in the ownership of the Tregothnan Estate) one of the main draws to this part of Cornwall is the proximity to Truro with its schooling, hospital, theatre, mainline railway station, and shops including a flagship Marks & Spencer store and Waitrose. To the south at Loe Beach there is a sailing school and deep-water moorings, with more sailing and water sports facilities at Mylor and Falmouth, a large port and thriving university town. The area is now well-served with road links - the A30 dual carriageway just to the north of Truro connects to the M5 motorway at Exeter. Truro has a railway station on the London to Penzance mainline with overnight sleeper service. Newquay Airport provides daily flights to London Gatwick. 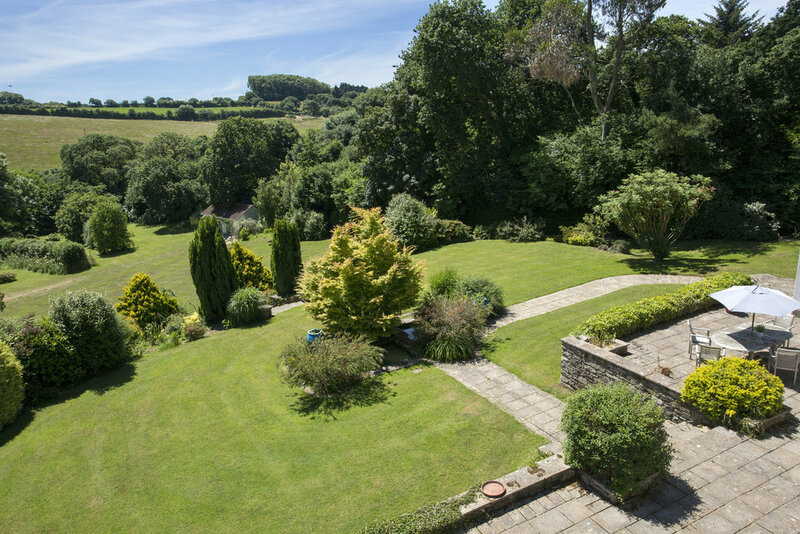 Built around 1980 overlooking unspoilt countryside between Porth Kea and Playing Place, Treveth is an exceptionally spacious house by today's standards, and it is becoming highly unusual to find a house with such generous accommodation occupying such a large plot. The reception hall is on two levels and incredibly light with glass doors across the south elevation, and part-glazed roof. 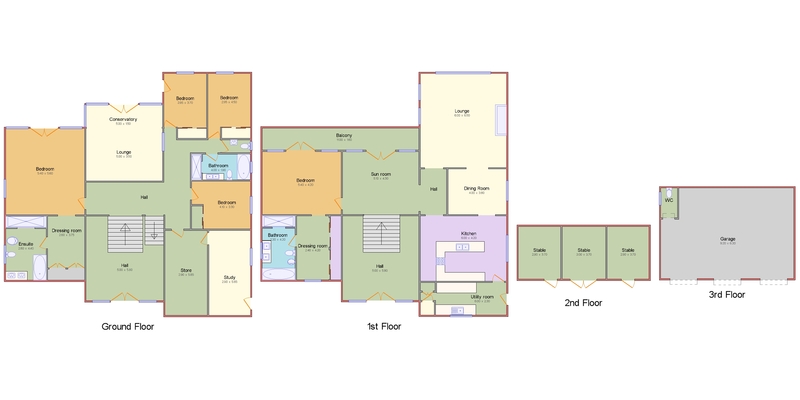 This is really the centre of the house and from the upper level there is access to the main reception rooms and master bedroom suite, while steps from the lower level lead down to the garden room, sun terrace, 4 further bedrooms, study/office and store room. The two largest bedrooms have fabulous en suite bathrooms with separate walk-in showers and doors out to terrace/balcony, while the kitchen is fully fitted with integrated NEFF appliances and a polished stone worktop. To the rear of the kitchen is a large utility room. The house is set well back from the minor road, with a private drive leading to a very generous parking and turning area, and a triple garage. The surrounding gardens are mature and well planted, and a set of wide steps lead down to the covered entrance porch. The majority of the grounds lie to the south of the house, descending into the valley, with farmland beyond. There is a huge sun terrace across the width of the house, with steps down to level lawns which in turn lead down to the rest of the gardens. These are mature and well planted with lawned areas interspersed and sub-divided with a variety of trees and shrubs. There is a detached stable block on the western boundary in the lower garden. Mains water, gas and electricity. Private drainage. Leaving Truro for Falmouth on the A39, take the third turning on the left, on a big right hand bend, signposted for Kea. At the next crossroads by Kea School, take the road straight ahead for Porthkea. After about a mile, take the first road on the right, to Playing Place. Treveth will be found after about ½ a mile on the left hand side.